Jod, a Nord warrior, is the captain of the guard in Dawnstar. He is also the housecarl of Jarl Skald. He is not nearly as adamant in supporting the Stormcloaks as Skald, caring more about the safety of the citizens of Dawnstar. He begins his day of service to Dawnstar by waking up inside the White Hall at 8am. He will then proceed to head downstairs and take his place beside Skald. He will stand by Skald's side for the next 16 hours, ready to perform whatever duties are requested of him. After spending his entire day on his feet, Jod takes a much needed rest by heading to his sleeping quarters located in the room above the Jarl's and will then sleep here for the next 8 hours. He was supposed to take two one-hour meals throughout the day, one at 7am and one at 7pm, but does not due to a bug in his schedule. If the Imperial Legion takes over Dawnstar, he will move to the Palace of the Kings along with Skald. He will spend his time here wandering around with the other exiled court members. Compared to the others, he is much less upset about being exiled, although he will still become unhappy when he sees you. Jod wears Pale guard's armor and fur boots and gauntlets, and he carries a steel war axe, a Pale guard's shield, and some common items and gold. While the citizens of Dawnstar are being plagued by nightmares, Jod will greet you with a reminder: "The Jarl is... tired. Be mindful of that." 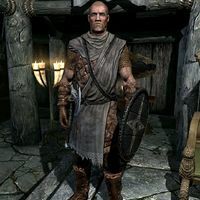 Otherwise, he will greet you with a fairly basic introduction: "I'm Skald's housecarl and head of his guard in Dawnstar." He does not seem to be very eager to go to war with the Empire, as he will often tell you: "My only aim is to keep the peace." However, he will tell you that Skald's view on the war is a little different than his own: "Skald is very... vocal about his hatred of the Empire." He seems to respect the power of the Imperial Legion, as he may comment: "The tenacity of the Imperial Legion is legendary. We need to be ready for them." He will then elaborate on this: "I served in the Great War against the Thalmor. I remember how bravely a Legionnaire can fight." When he is exiled and moved to the Palace of the Kings, Jod will not be interested in conversation and will simply tell you: "You should leave. Skald gets upset around Imperials." He may also tell you about how the loss of Dawnstar has impacted Skald and him: "Jarl Skald is upset over the loss of Dawnstar. I'll admit, it's less I have to worry about." Jod was supposed to eat from 7am to 8am and also from 7pm to 8pm but does not. This is due to other packages taking precedence because of his housecarl alias, which causes him to only perform his sleeping package along with the package that has him stand by the Jarl. This page was last modified on 12 December 2014, at 05:04.